The 2013 Nobel Prize in Physiology or Medicine has been awarded to James E. Rothman, Randy W. Schekman and Thomas C. Südhof "for their discoveries of machinery regulating vesicle traffic, a major transport system in our cells". 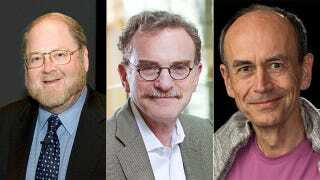 Above, from left to right: Rothman, Schekman and Südhof, winners of the 2013 Nobel Prize in Medicine or Physiology for their contributions to our understanding of cellular trafficking. "Without this wonderfully precise organization, the cell would lapse into chaos," the Nobel Assembly said in a statement. "Through their discoveries, Rothman, Schekman and Suedhof have revealed the exquisitely precise control system for the transport and delivery of cellular cargo."